Hope everyone is enjoying the Christmas season with all the smells of baking and the joy of decorating your homes. 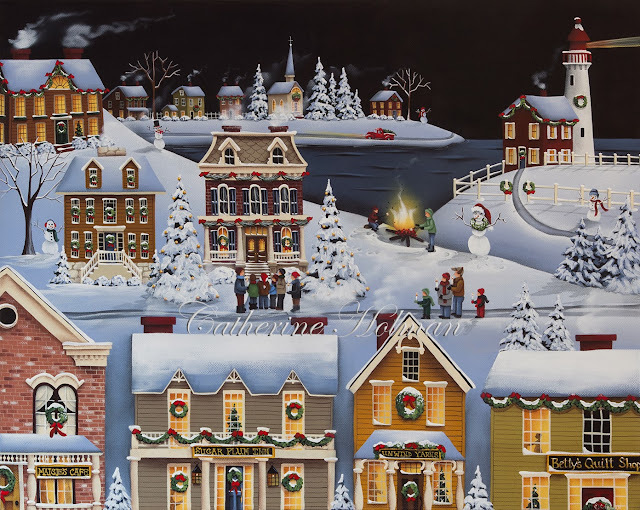 As cozy as Winterberry appears in the summer with all the sailboats on the water and children laughing and swimming at the beach, there is no better time to visit than during the Christmas season. Blazing bonfires, carolers, and shops decked out with their festive finery make you feel like you've stepped back in time. While staying at the Sugar Plum Inn you can cozy up to the fire after stepping out for a hot meal at Maisie's Cafe or make a quick run to the Unwind Yarns store for some knitting needles and a new skein of hand dyed yarn. By the way, all the beautiful quilts adorning the beds at the inn are from the lovely quilt shop just down the street and Betty is giving a 20% discount through the holidays. Absolutely wonderful! Wishing you and your family a very Merry Christmas!